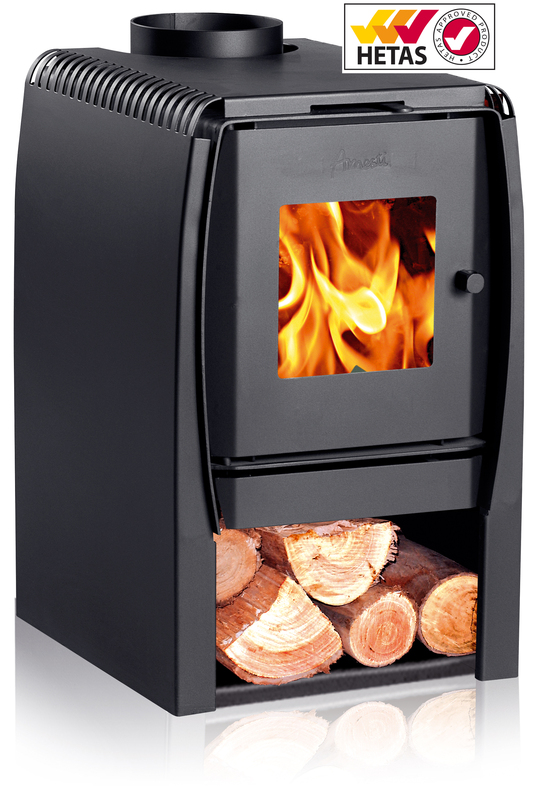 For 27 years, Amesti have been developing clean burning efficient wood burning stoves from their factory in Chile. Chile is a wooded country where heating is required six to nine months of the year, and the main heat sources inside dwellings are wood burning stoves. Chile has one of the lowest legal thresholds of breathable particulates, so Amesti stoves are amongst the cleanest in the World. Amesti have developed a unique clean burning process at the key 600 degrees temperature, with a 3-stage air inflow, giving particulates emissions below 2gr/hr. This makes the Amesti stoves a first choice in cities (DEFRA approved), and an excellent investment for environmentally-and energy price-conscious consumers. The Amesti NORDIC range of four stoves are the first product being introduced, a contemporary looking quality range of wood burning stoves, designed to agreeably fit any room, with smooth slightly curved design and log storage, all with CE en13240 and HETAS approval. The enlarged double combustion chamber and air injection system, achieve greater permanence of the blaze and easy ignition. The right balance between design and efficiency the Amesti stoves combine a decorative object with an efficient and clean burning wood burning stove, ideal for modern environments and suitable for smoke control areas. Available in four sizes ranging from the Nordic 350 with a heat output of 6.95kW to the Nordic 450 that boasts a massive 13.95kW heat output, meaning these stoves will be ideal for those looking to heat rooms anywhere from the average living room up to a room area of 100 square meters. Can A Double Sided Stove Work For You?